Mini schedules or activity schedules are probably not new to you on my blog. I talk a lot about visual supports and the usefulness of them in instruction. I find them useful for students with ASD but also for lots of other students. 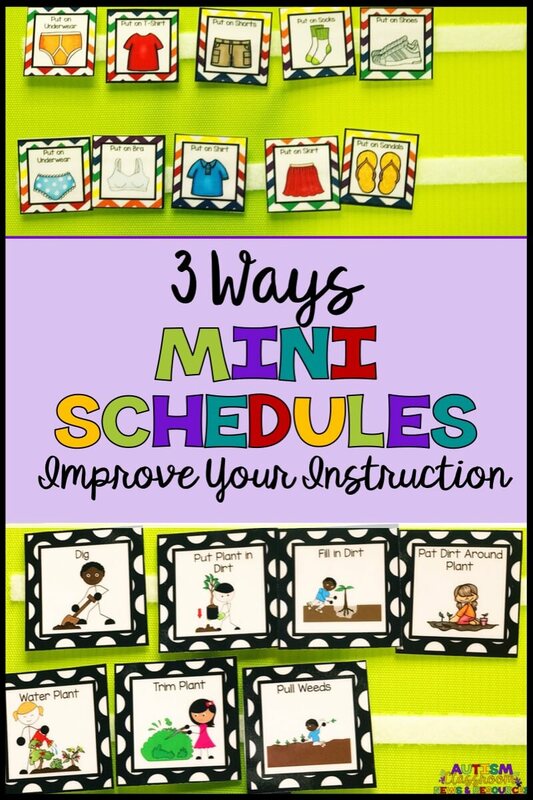 Here are 3 ways that mini-schedules can improve your classroom instruction and help your students learn better. Many of our students become easily dependent on verbal prompts, or prompts in general. For students with autism, this is because they may not attend to the relevant information in their environment. So they may attend more to the prompt than the cues of the task. For other students, it might be a similar reason or just because they hear our verbal directions so frequently they come to rely on them. So, our teaching is typically most successful if we use more nonverbal prompts. If your student can understand pictures, then an easy way to nonverbally prompt is to point to the picture of each step. This can then easily be faded by fading the point (i.e., moving your finger farther away, waiting before pointing to see if there is independence). By using nonverbal prompts, your students learn to follow that first direction (i.e., "load the dishwasher") and then the steps of the task become the cues they follow for the next step. You say, "load the dishwasher" and the student opens the dishwasher. The open dishwasher then cues him to get a dish. The dish in his hand then cues him to put it in the dishwasher. Let's face it, visual schedules aren't just for our students. Mini schedules cue the staff on the steps of a task. They remind all of us about what comes next. This is important because when I wash dishes and you wash dishes, we probably don't do it exactly the same way. Let's say I put the dishes in the sink first and then fill it with water. But you put the water in first and then add the dishes. The order of the steps would be different whether you taught Sam that day or I taught him. Our students need explicit instruction and they need that instruction to be consistent. If you and I teach skills with different steps or in a different order, they might eventually learn to do it one way with you and another with me. But in the end, it is going to take longer, be harder, and generally make our instruction inefficient. Mini-schedules are set up so that the student and all the staff complete the task in the exact same way each time. Even though I put the dishes in the sink first, if the team decides that filling the sink before putting in the dishes is important, we would do it that way. So I don't prompt Sam to put the dishes in the sink before filling it. 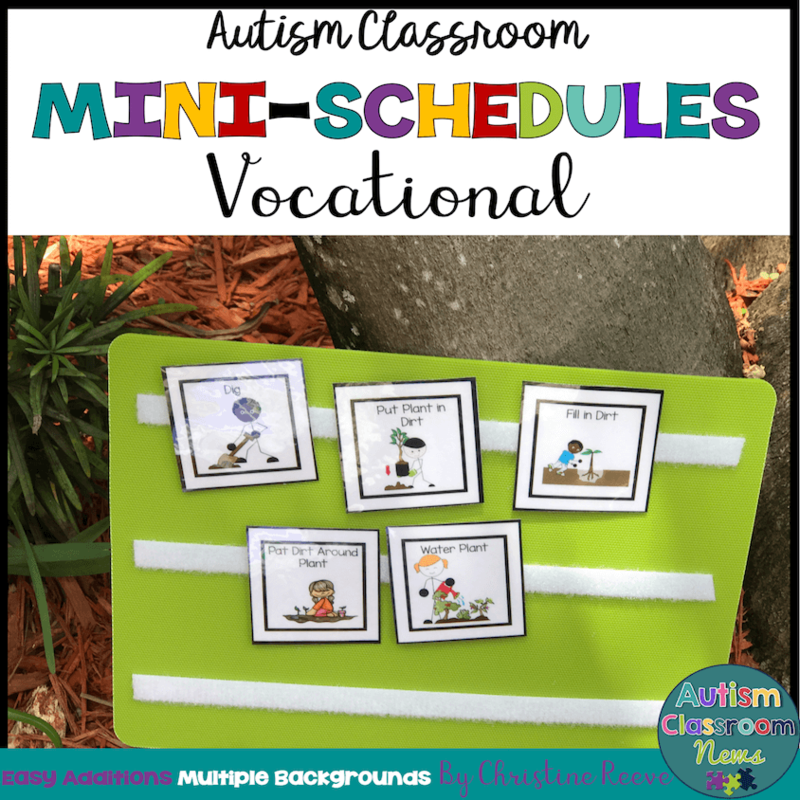 Finally, the most important reason for using mini schedules in the classroom is that the adult can fade out and the student can complete the task with just the schedule. This increases this student's independence. Yes, I know some of you are saying, but he has a schedule so he's not independent. And yes, we could eventually fade out that schedule is needed. But am I less independent going to the grocery store with my grocery list --something we are all taught to improve making good food choices (not my strength)? I think not. I'm being a good shopping planner. So why would we think that a student isn't if he has a grocery schedule or a picture list. Another example. What about a student with an AAC device to talk. I hope we would never think we need to take that away from him to help him be more independent. Because it would make him LESS independent to be without it. Why are schedules any different? Do you have a checklist for packing for a trip? Do you have directions you look at to start your grill (if you're paranoid about blowing it up like I am)? Long and short...if the student can go to the grocery store with a visual schedule but without an adult telling him each step, he is more independent, not less. If he can wash his hands in the bathroom with a visual schedule he takes out of his pocket but without an adult having to accompany him....he's more independent, not less. Those are my ways that mini-schedules can help make students both faster learners and more independent at a variety of functional skills. If you are looking for mini-schedules you can print and use, check out my mini-schedule bundle on TpT. All of the pictures in this post came from the Life Skills Mini-Schedule pack or Vocational Skills Mini-Schedules. 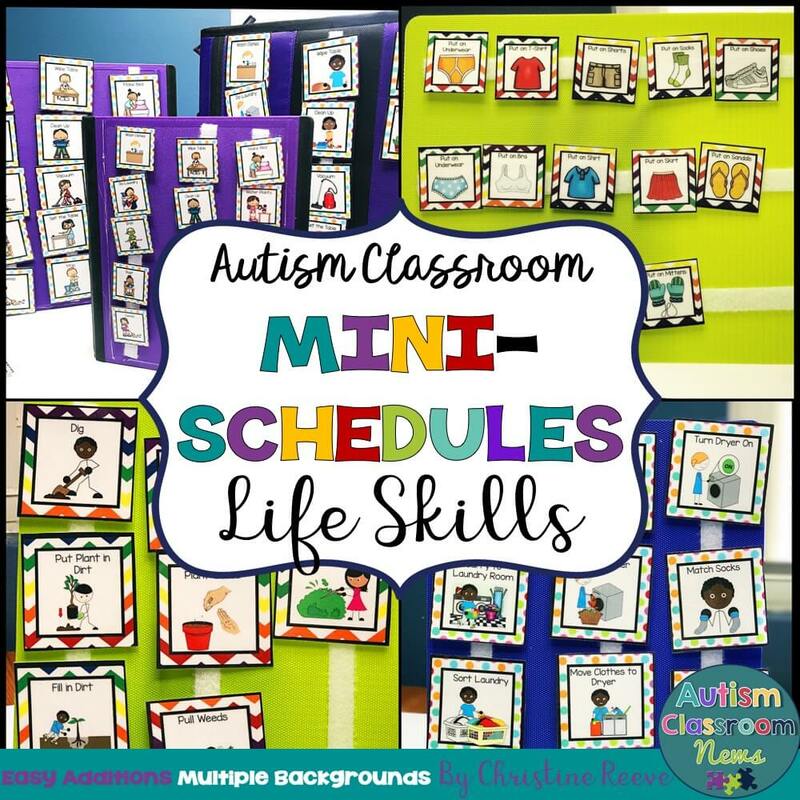 I'd love to see how you use mini-schedules in your classroom! « Do You Believe These 5 Things About Life Skills Programs?